Tori Foutz (Eunice) is a native Texan and mother of three beautiful kids. She has had a flare for drama all of her life. She is recent graduate of Texas A&M- San Antonio. She is also a member of Keith and Margo's Murder Mystery Dinners. She recently completed Raisin in the Sun, and The Ballad of Emmitt Till directed by Vincent Hardy and produced by The McNay Art Museum. She is grateful to her family and friends for their love and support. Rick Frederick (Stanley) is an actor, director and designer living and working in San Antonio. He is also the Managing Director of AtticRep and has been with the company from its inception in 2005 when he played Nic in One for the Road. Some Other acting credits with the Rep include: Thomas and Pilate in Last Days of Judas Iscariot; Carter in Fat Pig; Austin in True West; Ross in The Goat or Who’s Sylvia? ; Father Kevin in The Irish Curse; and Alan in God of Carnage. Other San Antonio credits include: Tennessee Williams in Rancho Pancho for the Classic as well as in Hollywood and Time for Jumpstart. Chicago credits include: Woyzeck in Woyzeck; Ariel in The Tempest; Dr Lvov in Ivanov; Dr Astrov in Uncle Vanya; The Beggar in Giraudoux’s Electra; and Chorus Leader in Berkhov’s Agamemnon (which had a 2 year run) all at the European Repertory Company. Recent Film roles include: Hunter in Daniel Baldwin’s Wisdom; Carol Burnett in HOA Holes; and Foster Merkel in Let’s Kill All the Lawyers. San Antonio directing credits include: American Buffalo; White; Theatre for the New World Disorder at the Rep. He recently designed the Set for Zoyka’s Apartment for the Volkhonka Theatre in Yekaterinburg Russia. Mindy Fuller (Stella) is grateful for this opportunity to work with such an exciting group of artists. Mindy holds a BFA in acting from Texas State University and attended the MFA graduate program at University of Florida. A regular on boards of the San Antonio Theatre Scene Mindy’s favorite roles include, Colombia in The Rocky Horror Picture Show, Junie B in Junie B Jones, and Maggie in Cat on a Hot Tin Roof. She was last seen in Time Stands Still as Sarah, at the Cellar Theatre, for which she was awarded the 2013 ATAC Globe for Excellence: Lead Actress in a Drama. Recently Mindy has branched out and has added a MSOL to her academic credits and will graduate with an MBA on Dec 14th 2013. Mindy wishes to thank her husband Brett Fuller for his love and support, without which she would be far less. David Sanchez (Steve Hubbell) is a native of Denver Colorado, but is happy to call San Antonio is home for the last 5 years. He's a chef and has been cooking for the last 16 years professionally. He also paints and does origami. He has worked with Classic Theater playing Borraccio in Much Ado About Nothing and AtticRep's Forum Theater project on love and marriage. Byrd Bonner (Mitch) is honored to be a part of this wonderful production. Byrd has appeared on most all of San Antonio’s stages. He appeared in Little Shop Of Horrors, Urinetown The Musical, Roads Courageous, A Christmas Carol The Musical I-Iii, Miss Saigon, The Light In The Piazza, I Hate Hamlet, Curtains, City Of Angels, On The Twentieth Century, Follies, She Loves Me, Rags, You’re A Good Man, Charlie Brown, among others. Byrd thanks his loving wife and daughters for their support of his love of the theater. Rita Duggan (Mexican Woman) has appeared in over 40 theatrical productions in the South Texas area. Among her favorite roles are Mrs. Medlock in The Secret Garden, Fastrada in Pippin, and Anytime Annie in 42nd Street. She recently appeared in The Producers at the Woodlawn Theatre. This fall, she will reprise the role of Doña Juanita in Las Nuevas Tamaleras at the Guadalupe Theatre, for the fourth consecutive year. Choreography credits include Chicago and Monky Business. This one is for her fellow English majors! Sam Carter Gilliam, AEA (Blanche) is a member of Actors’ Equity Association and serves as an instructor for the Department of Human Communication and Theatre at Trinity University. Her career in the professional theatre and arts education spans over 35 years. A passionate advocate for the arts, Sam presents keynote performances for educational conferences and leads spiritual retreats throughout the United States. Favorite stage roles would have to include Irene, in “A Lady of Letters,” from Alan Bennett’s collection, Talking Heads; the title role in Zelda, a one-woman performance based on the life of Zelda Sayre Fitzgerald, wife of F. Scott Fitzgerald, as well as the title role in Molly Sweeney (SA Public Theatre); Amanda, in Tennessee William’s The Glass Menagerie (Springer Opera, Columbus, Georgia); Gertrude, in Hamlet (UIW Guest Artist); and Emily Dickinson, in The Belle of Amherst.These days Sam performs original works from her growing collection of biblical characters, and continues to develop the adventures of a curmudgeonly Episcopalian lady, loved and feared by all,Mrs. Barrington. Of greatest joy is her partnership and collaboration as a visual artist with her husband, Steve, in their theatrical design company, SLG Design & Creative Talent. Their designs have been seen across the USA and Canada, including a 20-year summer residency at the St. Louis Muny and four national tours of Fiddler on the Roof. If you visit Sea World of San Antonio, you might catch Pets Ahoy, and The Cannery Row Caper, which play on sets designed specifically for the antics of animals, including the grandest diva they’ve ever encountered: a decidedly temperamental walrus. Ever been kissed by a walrus? They have! Linda McCullers (Nurse) performs regularly at the Witte Museum Gallery Theater, with the Alamo City Community Marching Band, and with the San Antonio Pipes and Drums. She serves on the board for the San Antonio Theatre Coalition (SATCO). Sonia Rodriguez (Mexican Woman) has a BFA in Acting and theatre education from SWTexas State and teaches theatre arts and directs at Pleasonton Junior and High schools. She has appeared in numerous English and Spanish productions and has performed in NYC, NJ, Dallas, and Mexico as well as in San Antonio. Sonia has been playing Josie in San Antonio’s own Christmas tradition, Las Nuevas Tamaleras since 1993. She is thrilled to be part of the cast of Streetcar Named Desire and would like to thank her parents, family and friends for all their love and support. Apollo Campos (Pablo). Eduardo Anastacio "Apollo" Campos II is un pruducto de San Antonio, Texas and has performed in Corpus Christi, The Laramie Project, and Man of the Flesh. He thanks Dios lo que se llama, Tia Alice, Emily, y Camilo por cada dia. 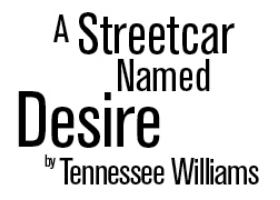 He's flattered, honored, and overjoyed to be performing in a Streetcar Named Desire at the Carver Community Cultural Center under the directorship of Carol Lee Klose. Yolanda Gamble (People of New Orleans) is a graduate of Actors, Models, and Talent for Christ (AMTC) Bridge Training Program and recently competed in their SHINE showcase in Orlando, FL. She recently played Beneatha in “A Raisin in the Sun” and other theater productions. She is a former member of ComedySportzSA Improv Troupe and has worked on film and television projects. She is part of a dynamic team at a local non-profit, called Urban Connection-San Antonio. She sends her love and a big thanks to all her family, friends, and supporters! Dan Walker III (Doctor). Dan’s love for acting began as a child with an appearance in Porgy & Bess in Berlin, Germany. He has played integral roles in A Raisin in the Sun, Black Nativity, Into The Woods, and Our Town, to name a few. He seeks to continue stage performances as well as voice over work. He would like to thank his friends and family for the years of support in his musical and theatre quests, and Carol Lee Klose for the opportunity to be a part of this classic stage production. Andrew Olmos (The Collector, people of New Orleans) is currently a Music major at SAC. Past roles include Felix in The Owl and the Pussycat and Hal in Picnic. Martha Prentiss (People of New Orleans) was last seen on stage in The Vexler's production of Glengarry Glen Ross as the investigator. Some of her other roles have been as Gertrude Stein and as Charlotte Cushman. She also has a zombie movie to her credit The Killing Strain which has popped up on The Chiller Channel several times. Martha is proud to be part of such a talented cast. Michelle D. Burnett (Black Woman; People of New Orleans) has been in acting all of her life. (Or at least that's what family members say). She has worked with St. Philip's College, The Woodlawn Theater, Pennington Studios, and the Renaissance Guild here in San Antonio in such shows as Dinah Was, The Wiz, All Shook Up, and Raisin in the Sun. Michelle would like to thank her family, friends, and church for all their support. Tiffani Willis (People of New Orleans) trained in Theater Arts and Tech at Texas A&M and has had feature and principal roles with the Renaissance Guild, Pennington Productions, and TAMUCC Theatre. She has been working in film for 12 years and is a skilled Black Jack Dealer!